A surprising number of bloggers new to me liked my variation on a recipe for stuffed mushrooms (posted 1 Dec ‘18) so I decided to post this one. First and foremost it was the way this ‘recipe’ was presented which attracted me. Normally I do not like video clip recipes, in fact I really dislike them, I much prefer written instructions. This one was clever enough (and had accompanying written recipe) but simple enough to persuade me to make the recipe – with a change. A second attraction was the incorporation of small sautéed cubes of potato which recalled Swedish ‘pytt i panna’, more usually now written ‘pyttipanna‘, which I used to make regularly years ago to use left over roast beef. Now I understand this is to be found in up-market Swedish restaurants, with a fried egg. I much preferred to serve it with the traditional raw egg in its opened shell to be mixed in before eating. This Swedish dish was in turn brought to mind by a ‘breakfast’ cooked recently by my Latvian blogger friend Ilze (which she referred to as “Latvian rubbish food” 😜). 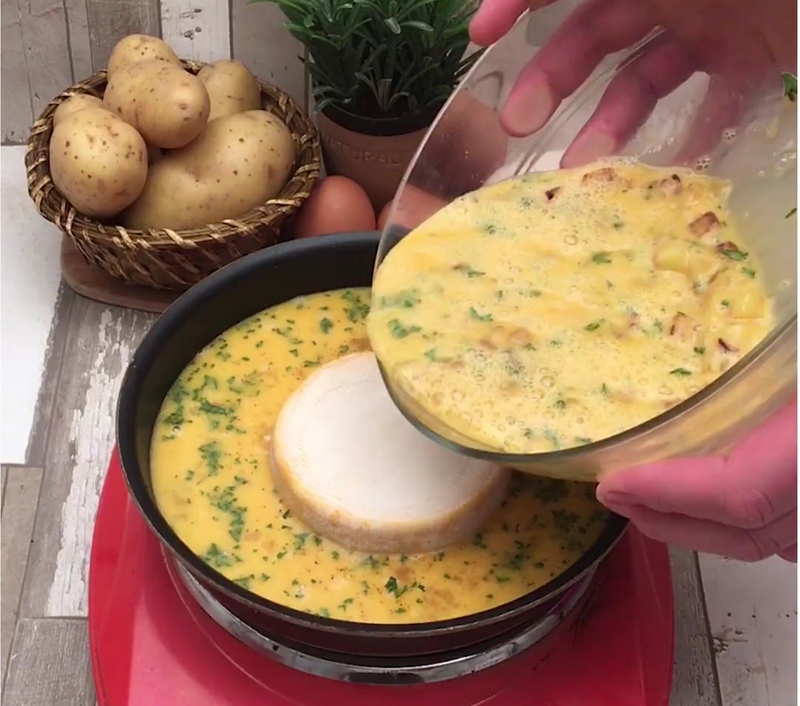 There was one problem: I doubted Petronela (my wife for any newcomers to this blog) would eat anything incorporating cheese looking rather like Brie or Camembert, neither of which she will eat – though I’m pretty sure she’s never tasted either. We’re talking about that wonderful Swiss cheese ‘Reblochon’, made from a second morning milking of cows, so delightfully creamy. So, for Petronela, how to follow the idea without Reblochon? Rememembering how much she liked the ‘stuffed mushrooms’ I decided to follow a similar idea for the cheese: for the two of us, about 200g of cream cheese with about 100g of Parmesan finely grated into it, well mixed then formed into a little round cake, and four eggs. Like with the stuffed mushrooms we ate with half a baked potato with butter. I discovered Reblochon when we (luckily) ordered Tartiflette in Annecy, France, in 2002. I soon discovered that any cheese that makes me feel like i’m Sitting in a cow patty is a favorite of mine! Great recipe!